EGP, or Experimental Gameplay Project happens every month where a theme is given, and you have to develop a game within 7 days and submit it. It's an event that I'd longed to join for a long time, but never really got around to joining it. This month's EGP has just started, with a theme, "Audio Input". The theme for the previous EGP in June was "Rotating", and they've got 7 games submitted. I'll only review some of the game which is either made for web, or double platform (PC and Mac), as I do not own a Window-running hardware at the moment. So let's get the reviewing started~! 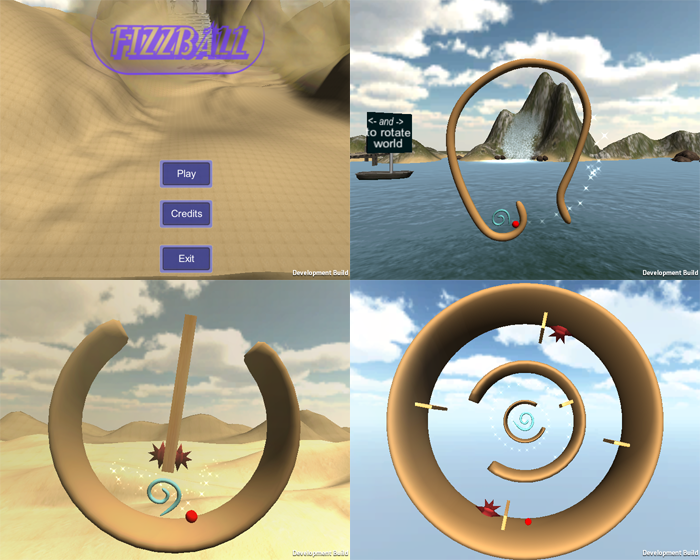 The mechanic for Fizzball is basically rotating the platform so that the red ball can reach the portal. If it hits the red, sharp thingy, the level will reset. You can use left and right button to rotate it clockwise or counter-clockwise. In terms of concept, it's very typical, some of the developers also uses the same "use some controls to rotate the platform" concept for their EGP submission. Although the concept is not "new" enough, the level design is very interesting, I had a lot of fun playing through it. Hopefully the developer would continue adding more levels, polish up the arts, and publish it. SlingIt, is something really experimental. At the start of the game, you have a cube which are tied towards another rectangular object, rotating either clockwise or counter-clockwise. Pressing "Space" would release the string, and launch the cube towards the direction it was rotating at, at the time of the string-release. And you have these black cubes, which are the bad guys who will come and harm you when they got too near, and your health might be reduce too, unless if you don't destroy them. To destroy these bad guys, you just wait until the cube is swinged at the direction of the bad guys, and then release it. The bad guys will be destroyed when hit by the cube. If my description is not clear enough, just go ahead and play the game, and experience the amazing mechanic yourself. Despite the simple graphic, it's very interesting and challenging. I spent a lot of time paying attention at the rotating cube so that it would hit the bad guys, at the right direction when I release it. Can't wait to see the developer turning this into something bigger~! 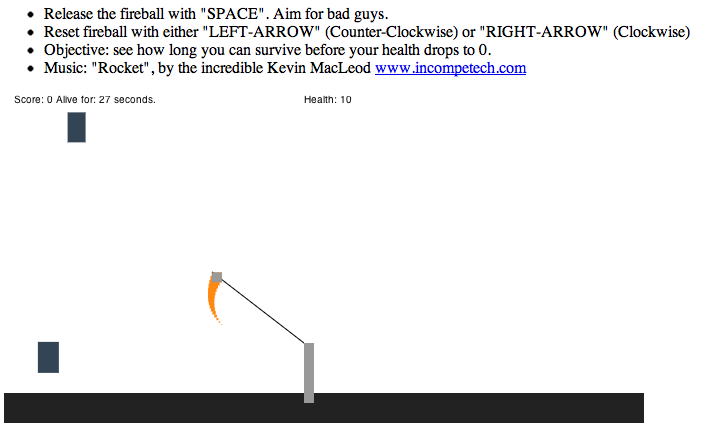 This is that other game which I mention earlier, that uses the same "use some controls to rotate the platform" concept. 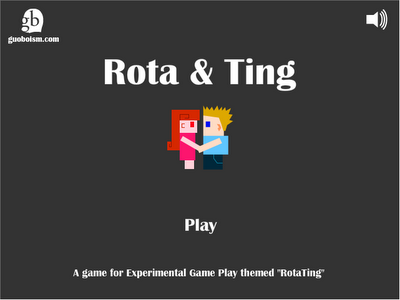 Rota & Ting is also a game where you must get something into a portal to the next level. Except that it has a much polish art, some simple physics, and a narrative voice. The game is not really that hard to beat, but it can get kinda annoying when some of the stuff in the game block your way to the portal. But that's part of what the game is about, those stuff in the environment are meant to block your way, and you just have to rotate it clockwise or counter-clockwise to get the main character out of those junks and into the portal. It's not very interesting, but I like his effort of putting the "story" element into the game, although it didn't really gave much "extra" effect. You started out as a black cross which can move around by pressing the directional button. As you get close to a shape, you will be "moving into" the shape and continue doing the same thing in that shape. As you go further, you're allow to use Z and X to rotate the black cross so that it match the rotation of the white cross below, before you can then focus on and "moving into" a shape... over and over again. For those who still don't understand what I'm saying, I suggest you go check it out yourself. Now, back to the review~! This game can get a bit confusing sometimes, maybe it's the explanation not being clear enough, or it has some bugs. After a while of playing it, and seeing the shapes kept on rotating, it can give me some serious headache. This game is "experimental", but just not interesting enough. The game, is as the developer has said: "destroy as many asteroids as possible before your ring is destroyed. 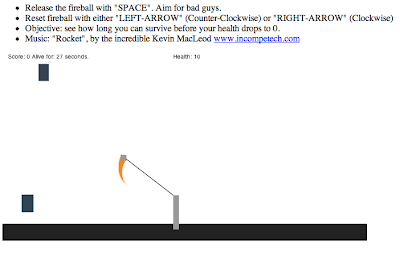 The challenge is that you must think about three things at once – shooting the asteroids, moving away to keep the asteroids from hitting your ring, and making sure your own shots don’t hit your ring. The more of your ring is destroyed, the faster and more numerous the asteroids will be." I have to make three decision at the same time, which based on my experience of playing it a while ago, is not easy. It has potential, but for now, it's insanely hard. Some modification I can suggest for the developer is that, I hope you can slow things down for the players. At the start of the game, don't make them think about 3 things at the same time, and don't make the ring spin so fast. Help them understand how shooting through the rings works, how you can't let the asteroids hit your ring, while at the same time, spinning the ring at a much slower speed (for beginner). As they progress through the game (shoot down more asteroids? ), their level increases (so is the game's difficulty), and the ring starting to spin a little faster. That would ease the pain in my brain. So, that's all that I can say about these games. Sorry for not be able to review the other two games. Now I'm finding EGP more and more interesting. Hopefully I can get my chance (and time) to join it.